I am a long way from being an expert on growing tomatoes, but I have experimented quite a bit over the past few years, and thought I'd share what I've learned. Some of what I do might pertain to my soil and weather, so take whatever I say not as fact, but as opinion. The way I prepare the soil, whether it's heavy clay, loam or sand, is to dig a nice deep hole, at least 1 foot deep, and 1 foot wide. Even deeper is better. It won't hurt to add some organic mulch and work it into the soil. The mulch will loosen up clay soil, and add water retention to sandy soil. Leave at least 18 inches between plants. If I had the luxury of more room, I'd give them 3 feet between plants. Add a couple of shovelfuls of composted steer manure. What I do with steer manure, is buy it from the store in bags and let the bags sit for a couple of months before I use it. Sometimes when you by it from the store, the bag is still warm to the touch which means it's still hot and very smelly. After a few months of letting it sit, it mellows out and smells earthy. Don't use hot manure or it could burn the roots of your seedlings. Work the steer manure nicely into the soil, then add a handful of tomato and vegetable food (I've used EB Stone Organics and Plant Tone), a handful of bone meal and a handful of Epsom salts. The Epsom salts are a natural mineral and adds magnesium to the soil. I'm not too scientific about amounts. A handful to me is probably about 1/2 cup. This will take some research on your part. I've been planting several varieties and keeping notes of what grows best for me. If you are in an area where the summer is short, then choose a tomato with a short maturation time, if you have a long season, then you can choose just about any tomato variety. If you are going to buy your seedlings from the local garden center, they will have the varieties that grow best in your area, but the selection will be limited. If you grow from seed, the variety is enormous and you can have a lot of fun trying out new ones every year. 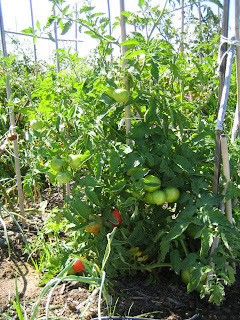 Check out my blog on "Best tomatoes of 2008" to find out which ones I'll definitely grow again next year. By the way, I am very fortunate to live in the temperate climate of Southern California with a long growing season. This also depends on where you live and what your weather is like. Basically, don't plant tomatoes between late September and February unless you have a heated greenhouse. You'll be wasting your time. Even with that, it's risky to plant in March. Tomatoes need night temperatures of at least 55 degrees. Below 55 degrees, you might get some flowers, but you won't see any tomatoes develop from them. The exception is if you grow a cold season tomato like Sub Arctic or Stupice, which I think still need a minimum temperature of 50 degrees. Of course, you can still try if you want, but don't expect a lot of tomatoes. Remember that just because they have tomato plants for sale at your garden center, it doesn't mean it's still the season to grow them. It could depend on the microclimate you have in your particular area. In general, I start tomatoes three times a year. The first set goes in the ground in late March, the second set around June and the third in August. I start harvesting tomatoes in May and it continues into late October. * Plant that seedling deep. Remove all the lower leaves below the top 3 and plant that baby deep. Roots will grow all along the buried stem and make the plant stronger. * Stick a long 7 to 8 foot bamboo pole in next to the plant when you plant it and train the plant up the pole by tying it up as it grows. Use something soft and stretchy like fabric strips or just tie it loosely with twine. Don't bother with those cheap 3 foot wire tomato supports. They're only good for very small plants. * Prune off the suckers. Do this so the plant doesn't become an out of control monster. It'll be easier to stake and you'll get bigger tomatoes too. Prune off the shoots that might pop up at the base of the plant too. Or you can save those shoots and plant them somewhere else. * As the season goes on and the bottom leaves start yellowing, pull them off to slow down the spread of late blight.